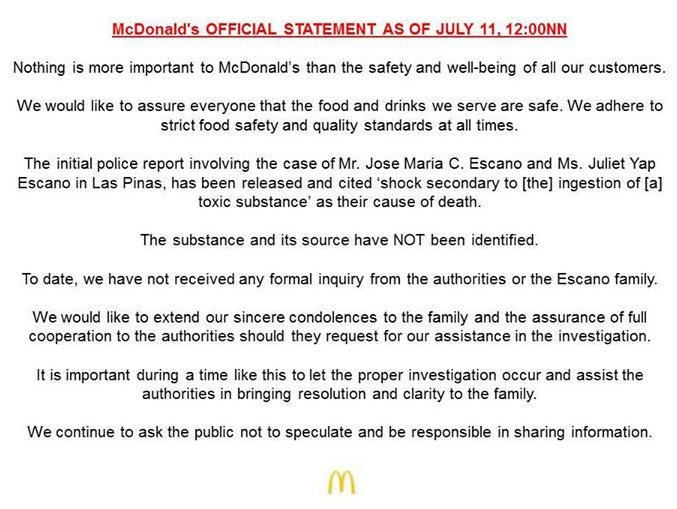 McDonald's released an official statement regarding the alleged food poisoning incident at its Evia branch that led to the death of two customers. Reposting from a friend's text. Still waiting for confirmation if these are true but it's still better to be cautious for the meantime. "From a parent in DLSZ [De La Salle Zobel] Grade 3 earlier this morning.... Sharing my Husband's txt: Stay away from mcdo, jollibee or fastfoods muna. From another friend: Pj my friend called me 2am kanina nasa hospital siya. Wife passed away sa car pa lang. Husband sa hospital. 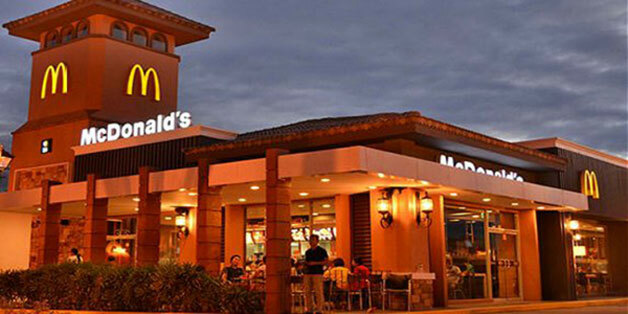 Mcdo Evia along Daang Hari." Nothing is more important to McDonald's than the safety and well-being of all our customers. We would like to assure everyone that the food and drinks we serve are safe. We adhere to strict food safety and quality standards at all times. The initial police report involving the case of Mr. Jose Maria C. Escano and Ms. Juliet Yap Escano in Las Pinas, has been released and cited 'shock secondary to [the] ingestion of [a] toxic substance' as their cause of death. The substance and its source have NOT been identified. To date, we have not received any formal inquiry from the authorities or the Escano family. We would like to extend our sincerest condolences to the family and the assurance of full cooperation to the authorities should they request for our assistance in the investigation. It is important during a time like this to let the proper investigation occur and assist the authorities in bringing resolution and clarity to the family. We continue to ask the public not to speculate and be responsible in sharing information."